Slip, slip, knit -- written as SSK -- in a set of knitting instructions stands for a commonly used and easy-to-execute left-slanting decrease. SSK is a single decrease, meaning it uses two stitches from the previous row to create just one stitch on the current row. It is both ornamental and functional and is used to shape a piece of knit work to accommodate the pattern or for a purely decorative effect. Pause when you reach the point in a set of knitting instructions calling for you to SSK. Slip the next stitch from the left to the right needle as if to knit by poking the right needle through the stitch on the left needle from the front left to the back right, and then slide the stitch off the left needle and on to the right one. Don't do anything with the working yarn. Repeat this exact process with the next stitch. You have completed the slip, slip part of SSK. To continue, poke the point of the left needle through the two stitches that you slipped onto the right needle from the back to front. Pass the working yarn clockwise around the point of the right needle, and then use the point of the right needle to tug the working yarn loop through the two slipped stitches. Slip the two stitches all the way off the right needle. This action is just like a regular knit stitch, but worked through two loops instead of one. The result is one new stitch created from two existing stitches. A slight variation on the standard version of an SSK decrease calls for slipping the first stitch knitwise and the second stitch purlwise. To slip a stitch purlwise, poke the right needle through the stitch from behind its front leg to the front left needle, and then slide the stitch off the left needle onto the right one. This variation of SSK results in a flatter, less pronounced ridge of decrease stitches. You will find no difference in the function of the stitch, only its appearance, so the decision to slip the second stitch knitwise or purlwise is just a matter of personal preference, unless the pattern calls the stitch out specifically. You might see pattern instructions to slip, slip, purl or SSP. This is the equivalent of SSK, but worked on the purl side of a piece of knitting. Execute this decrease by slipping the first two stitches as if to knit, and then purl the two slipped stitches together through their back loops. The standard symbol for slip-slip-knit used in charted patterns is a left-slanting backslash. If the box is white with the backslash symbol, this tells you to SSK on the right side of the work and SSP on the wrong side of the work. A gray or shaded box with a backslash symbol means slip-slip-purl on the right side and slip-slip-knit on the wrong side. You are working on the right side if you're on an even-numbered row and reading the row of the chart from right to left, and the wrong side of the work if you're on an odd-numbered row and reading the row from left to right. 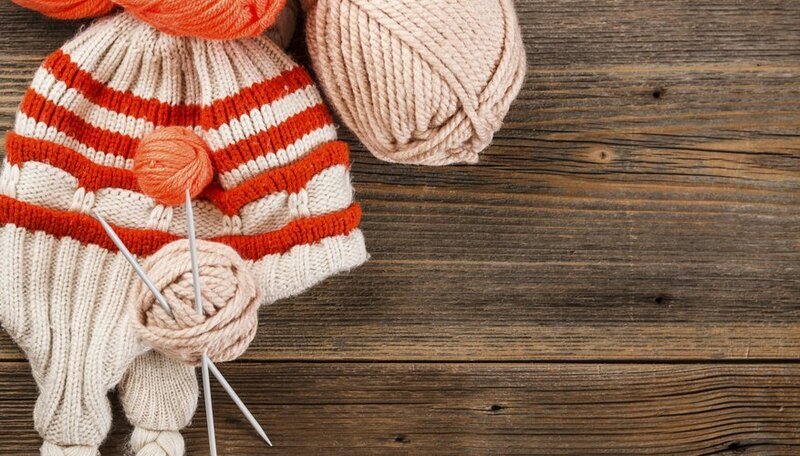 Increases and decreases are used to shape knit work. Left-slanting decreases, such as SSK, cause an otherwise straight piece of knitting to narrow with a left-leaning slant. Examine the regular V-shaped stitches of a stockinette stitch, which stand vertically. After working an slip-slip-knit, the V-shape of the stitch instead slants to the left. Left-slanting decreases paired with right-slanting decreases, such as knit two together -- k2tog -- result in a pyramid shape. Depending on the placement of single or paired decreases, shaping can create curved or diagonal edges. Items that call for such shaping include the body and sleeves of raglan sweaters, diamond-shaped shawls, the gussets of socks, the tops of hats and sweaters that nip inward at the waist. SSK is also used in conjunction with other stitches to create motifs in lace knitting. Two other left-slanting single decreases offer results that are functionally identical and visually similar to SSK. These are k2tog tbl -- which stands for knit two together through the back loop; and s1, k1, psso, meaning slip one, knit one, pass the slipped stitch over. You can substitute either of these decreases for SSK if you wish, but be consistent -- if you switch one SSK in a pattern for a alternative decrease, do so every single time the pattern calls for SSK.